UPDATE: Thanks to an anonymous commenter, I learned that ALL the 365 web videos are on an newer Jonas Mekas site that doesn’t seem to show up on individual video searches. ENJOY ALL 40 SHORT FILMS AND ALL 365 VIDEOS AT jonasmekasfilms.com. THANK YOU, ANONYMOUS COMMENTER! In light of yesterday’s shocking news that avant-garde filmmaker Jonas Mekas is suing art dealer Harry Stendhal for a supposed swindle, I wanted to share one positive highlight of the business relationship between Stendhal and Mekas that just surfaced online. Thankfully, self-professed art evangelist Kianga Ellis has posted 14 short films on her video channels — 13 on YouTube and one on Vimeo — that represent three episodes from the 365 web project and 11 from the 40 Short Films release. Alas, jonasmekas.com is no longer a functioning website, so these videos are some of the only ones from those Mekas projects that are accessible online — there are a few others scattered around the web, including this very zany segment from February 21, 2007, which records the filmmaker’s reaction to Britney Spears shaving her head, (he explains that he doesn’t trust artists who don’t go through nervous breakdowns since they are too normal), and a June 17, 2007, segment where Mekas shares his thoughts on Paris Hilton (who he respects for being able to change her mind, though his reasoning is a little odd). A 1964 video filmed in Andy Warhol’s Factory, which shows Warhol with some of his friends, including Baby Jane Holzer, Ivy Nicholson, Gerard Malanga, Gregory Battcock, and Gregory Markopoulos. The film is narrated by Mekas, who shares his insights about experimental film during the era and Warhol’s factory, which Mekas describes as “a psychiatrist’s couch.”— you may also be interested to read a review by Mekas of an early Warhol film that appeared in the Village Voice in 1965 and was posted on their website last year. 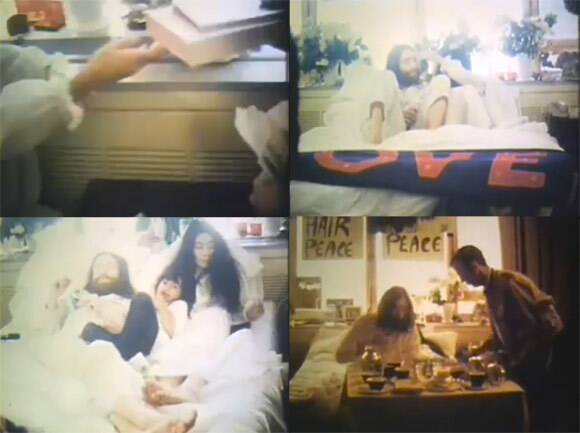 A 1969 film of John Lennon and Yoko Ono’s “Bed-In” (1969) in Montreal, which is probably one of the more artistic of the shorts. Salvador Dali at Work (1964), which features a series of Happenings staged by Dail in New York in 1963-64. A film portrait of Dr. Carl Jung at his home in 1950. A Fluxus boat trip film titled, “Fluxus on the Hudson” (nd). An almost YouTube-like video titled “Allen Ginsberg Singing”m (nd). A rather poetic 05:12 film titled “fragments of AN UNFINISHED BIOGRAPHY OF JACKIE & LEE” featuring Jacqueline Kennedy Onassis and Lee Radziwill that captures some odd private moments from their lives. Each daily dose is under 10 minutes, and their effect is collective; a years’ worth of these forms a digital approximation of the monumental quality of his long-form films. You can do with those films whatever you want. You can carry them on your iPod, literally in your pocket. You can download them and screen them wherever you want. You can use any existing technology on them. Online and related to these two proejct, you can also find the original Stendhal Gallery press release, an interview with NPR and an interview on Senses of Cinema. If anything, I think these newly resurfaced clips remind us why Jonas Mekas is such an intriguing artistic voice that continues to evolve. I hope after his legal issues are resolved we will continue to see interesting things from him.